Sometimes a case can be just as good as a club. Virgin Wines offers deep discounts on cases, and if you like what you taste, you can always go back for more. You can also join The Club from Virgin, and expand your wine horizon every three months. Select from world-class reds, mouthwatering whites, or the perfect mix of both. Plus, for your first shipment they include 2 stemless Riedel Crystal glasses. They include a money-back guarantee on every bottle you receive and if you decide to continue your membership, a new case will be delivered every three months. 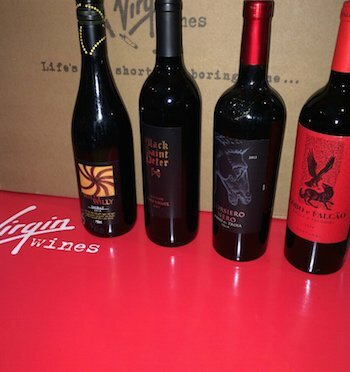 Virgin Wines is part of the Virgin Group, run by Sir Richard Branson himself, that includes everything from planes to music to cell phones. Regardless of the business, the same values apply: great product, great value, great service. This certainly applies to Virgin Wines, and we think that you'll notice the difference. Another way to sample a wide selection of wines at a great value is to try Virgin Wines' seasonal selections. You'll get to try hand-picked wines perfect for this time of year, and you'll enjoy big savings over individual bottle prices. There's never been a better time to stock up on world renowned wines! ​If you've ever had the good fortune of flying on Virgin - either domestically or overseas - you'll know they make you feel like a rockstar. Well guess what? So does their wine club. Unboxing The Club from Virgin Wines is fun, exciting, and delicious, all at the same time. Rock on. With a great selection of wines to buy by the case or bottle, a stellar quarterly wine club, and custom seasonal cases featuring award-winning wines and customer favorites, what's not to love? Plus, Virgin Wines guarantees that you will love every bottle you receive, or they will refund you your money. It's as simple as that. Sign up with Virgin wines today!